Golden Roulette Victory 5 Player Gaming Machine is a casino and gambling game named after the French word meaning "small wheel". In the game, a croupier spins a wheel in one direction, then spins a ball in the opposite direction around a tilted circular surface running around the circumference of the wheel. The ball eventually falls on to the wheel and into one of 37 (in European roulette) or 38 (in American roulette) colored and numbered pockets on the wheel. Players place bets on the winning number and the color of the pocket, whether the number is odd or even, etc. Those who bet correctly win the money that has been bet against them. This 5 player machine easily controls the amount of players that can bet at one time. The cabinet uses modern LCD screens, but achieves a timeless and classic aesthetic which really stands out on a crowded floor and will keep players coming back time and again for more chances to win big! The Golden Roulette Victory gaming machine is well suited to clubs, pubs, casinos, and other similar recreational areas and is perfect for customers looking to spice up their location for an adult market. Golden Roulette Victory 5 Player Gaming Machine is a casino and gambling game named after the French word meaning "small wheel". In the game, a croupier spins a wheel in one direction, then spins a ball in the opposite direction around a tilted circular surface running around the circumference of the wheel. The ball eventually falls on to the wheel and into one of 37 (in European roulette) or 38 (in American roulette) colored and numbered pockets on the wheel. Players place bets on the winning number and the color of the pocket, whether the number is odd or even, etc. Those who bet correctly win the money that has been bet against them. This 5 player machine easily controls the amount of players that can bet at one time. The cabinet uses modern LCD screens, but achieves a timeless and classic aesthetic which really stands out on a crowded floor and will keep players coming back time and again for more chances to win big! 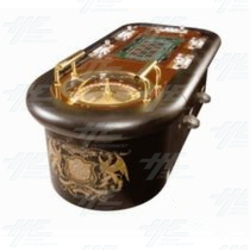 The Golden Roulette Victory gaming machine is well suited to clubs, pubs, casinos, and other similar recreational areas and is perfect for customers looking to spice up their location for an adult market.